If you are a fan or a groupie of the stage presentation or the movie version of the pop sensation “Mamma Mia!,” then hold on to your Greek passport and bridal veil for a special one night only musical treat. This romantic comedy told the tale of a young girl being raised on an island in Greece by her single mom who decides on the eve of her wedding to discover who her father is. There are a trio of candidates and Sophie Sheridan sends an invitation to each one. Such is the premise of “Mamma Mia!” and it served as a viable excuse to highlight the hit songs of the Swedish band ABBA. 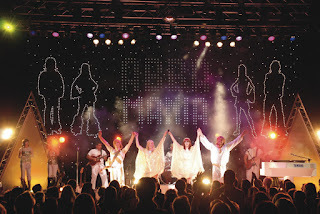 Now welcomes the amazingly successful tribute band ABBA Mania created nearly two decades ago and considered the best around. Formed in London’s West End, it will capture the highs and lows of the roller coaster ride that ABBA enjoyed when it explodes on stage of the Waterbury Palace Theater on Friday, February 10 at 8 p.m. for one performance only. The Swedish pop dance group ABBA held its crown for a decade from 1972-1982 and was one of the most popular international groups in the world at the time. The success of “Mamma Mia!” cemented their popularity even though the songwriters were not particularly excited about the project in the beginning and the group was in the process of breaking up. 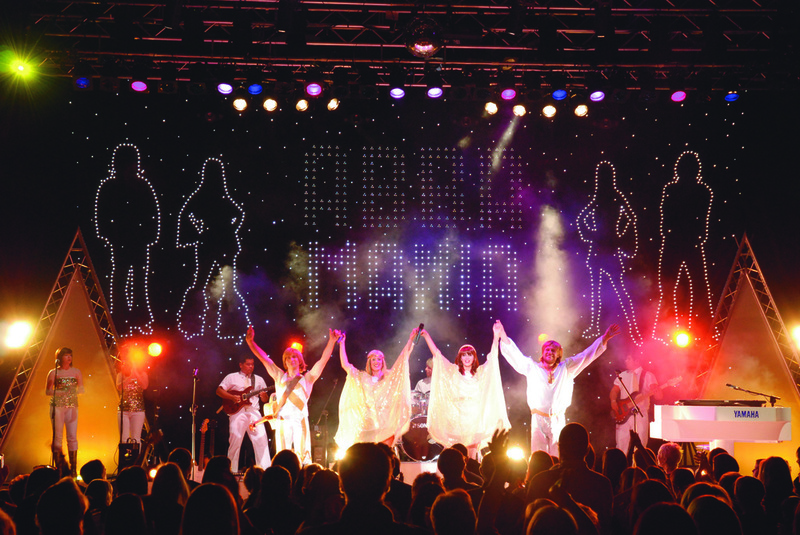 Now is the time to make your plans to pony over to the Palace to revisit the hit parade of tunes that brought ABBA to the top of the charts when the tribute band roars into town. Come hear Ewa Scott and Sharon Fehlberg on vocals, with Kristy McConnell and Mhairi Wilson as backing vocals, Adam Robertson as lead guitarist, Lewis Cunningham on bass, Sam Christson on drums and Steven Galert as musical director on keyboard. As a special bonus, the Waterbury Fire Dept Calendar Guys will be on hand pre-show to sell their Calendars and pose for selfies with attendees. Proceeds from Calendar Sales goes to CT Camps for Children who have been seriously burned and the Waterbury Boys and Girls Club. Come “feel alive” and be sure to thank them for the music. NO MISTAKING THE GENIUS OF "THE COMEDY OF ERRORS"
Imagine Zorba the Greek dancing into Bollywood and taking lessons in vaudeville and slap stick comedy from Laurel and Hardy and you have an inkling about the current Hartford Stage's truly delightful production of William Shakespeare's "The Comedy of Errors." Artistic Director Darko Tresnjak has pulled out all the stops, pushed the envelope to the limits and conjured up a splendid tribute to the Bard that is guaranteed to tickle your fancy. 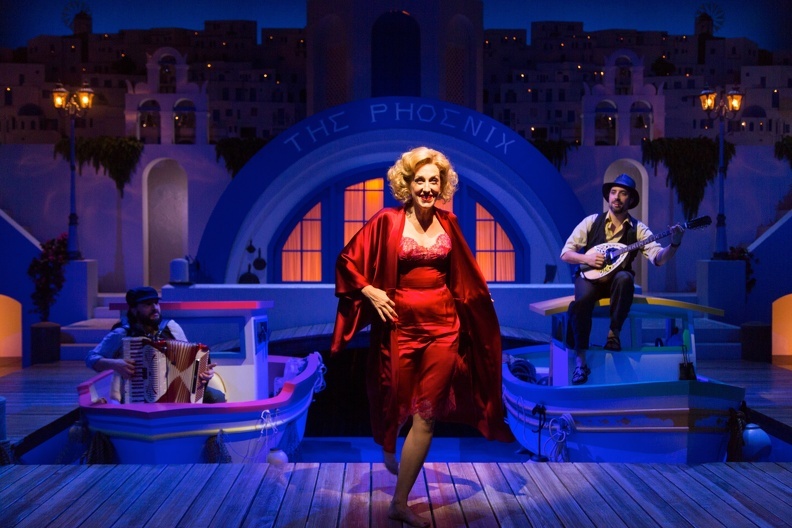 Until Sunday, February 12, forget your troubles and come get happy with Hartford Stage. It's 1965 and the sun bleached, white-washed set created by Darko Tresnjak welcomes you to abandon yourself as if on a honeymoon of pure pleasure. Not everyone on the isle of Ephesus is happy. Just listen to Adriana (Jolly Abraham) whose husband Antipholus (Ryan-James Hatanaka) is late for dinner and she sends their servant Dromio (Matthew Macca) to speedily fetch him. That is the precise moment that comic chaos starts to bubble over. Unbeknownst to each other, Antipholus and Dromio are pairs of twins whose other halves were separated years before in a tragic accident at sea. Now Antipholus of Syracuse (Tyler Lansing Weaks) and his Dromio (Alan Schmuckler) have just arrived on Ephesus and are quickly mistaken for their counterparts. Ephesus has a strange and dangerous law. Anyone who comes to the land must pay a huge fine or be sentenced to death. Quite recently a stranger, Aegeon, (Noble Shropshire) a merchant from Syracuse, seeking word of his long lost wife and sons, has had the misfortune to be caught by the Duke of Ephesus (Michael Elich) and given one day to beg for the necessary funds to save his life. Soon the two brothers and the two servants are mistaken for each other, the unwed one is besotted with the sister of the other's wife ( Mahira Kakkar as Luciana), a valuable gold chain created by Angelo, the goldsmith (Brendan Averett) goes missing and the two Dromios are pursued by the same woman Nell (Tara Heal), all with a whole lot of wonderful singing and dancing, especially by the courtesan (Paula Leggett Chase). Peggy Hickey's inspired choreography and Fabio Goblin's fabulous costumes add to Darko Tresnjak's glorious vision for a splendid production. For tickets ($25 and up), call the Hartford Stage, 50 Church Street, Hartford at 860-527-5151 or online at www.hartfordstage.org. Performances are Tuesday to Thursday and Sunday at 7:30 p.m., Friday and Saturday at 8 p.m. and matinees Saturday andSunday at 2 p.m.
Scandals and falsehoods, mistaken identities and sorcery abound and yet Shakespeare prophesies that "all's well that ends well" and this is certainly the case in this deliciously dance filled show. Nowhere can you find more old world charm, with the distinct flavor of Italy, in New Haven, than on Wooster Street. It fairly oozes tomato sauce and garlic cloves as it draws you tantalizingly down the block. 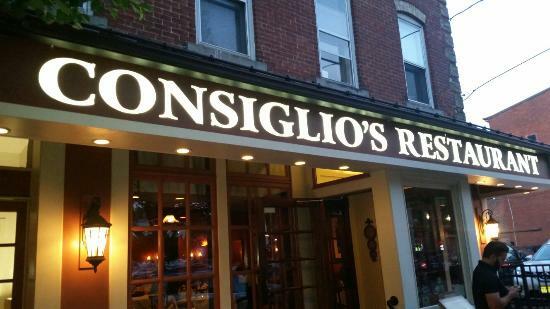 One sure stop along the way, after a myriad of selections of places to pick up a slice of thin crust heaven is the special family restaurant run by four generations of food connoisseurs, known as Consiglio's. For more than seven decades, Consiglio's has opened its doors, and in the summer its garden patio, to a virtual cornucopia of savory treats. Mystery theater has been offered over the past several years, led by that master showman Michael Sayers, as well as cooking classes on site with a seasoned chef to watch, learn and then enjoy a number of favorite dishes. Coming up are the mystery shows Heartbreaker, in honor of Valentine's Day, on Friday, February 17 and The Return of the Italian Leprechaun for St Patrick's Day on Friday, March 16. Dinner and show are $55 plus tax and tip with doors opening at 6:30 p.m. and the show at 7 p.m. Cooking classes on January 26, February 9 and 16 are already fully booked but there is still space on April 13 and 27 at 6:30 p.m. for such dishes as stuffed porkloin and Italian Kitchen pasta with homemade meatballs. Cooking classes are $65 and include a full multi-course meal. 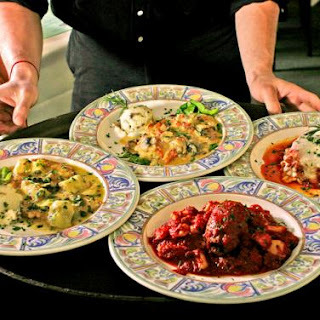 Now Consiglio's is ready to start a new tradition: Sunday Cucina Family Dinners, so get your appetite and taste buds ready to indulge. Beginning at 1 p.m and offered until 9 p.m., you will have your choice of four courses. This old school Italian meal will be served family style starting with a tasty selection of imported cheeses married to Genoa salami, with firm colorful olives, tangy roasted red peppers and pepperondini served over a bed of fresh greens. That's antipasto to the uninitiated. No meal would be complete without a pasta course and here we have a piping hot bowl stuffed to the brim with rigatoni, surrounded by a crowning of Nonna's homemade meatballs, sweet Italian sausage and Braciole, dressed in a zesty and flavorful house meat sauce. For the Carne course, prepare your tongue for the Chef's selection of vegetables surrounding generous portions of Chicken Piccata and Roast Pork Marsala, both entrees like a ticket to foreign shores of culinary delight. Be sure to leave room for the final sweet ending, Dolci, featuring a platter of assorted cookies and Italian pastries. 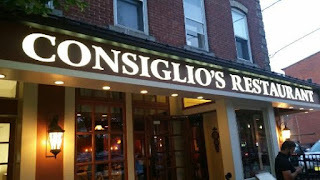 For reservations ($29.95), call Consiglio's Restaurant, 165 Wooster Street, New Haven at 203-865-4489 or go online at www.consigliosrestaurant.com for more information. Come discover the unique style of Italian cooking known as Cucina at the authentic Wooster Street home of Italy reborn in New Haven: Consiglio's. Buon Appetito! Have you ever written to Dear Abby for advice about love and life or sought a more spicy answer from the likes of Dr. Ruth? You might even have picked up a phone and placed a call to a radio maven like Dr. Laura. Even if you've never done any of those options, you can still pull up a chair at the tables at Connecticut Cabaret to pop a question or three to the current queen of advice Miss Abigail in KenDavenport and Sarah Salzberg's cute comedy "Miss Abigail's Guide to Dating, Mating and Marriage" playing weekends until Saturday, February 4. With Valentine's Day just around the corner, what better time to be sure you have all the answers to romantic queries that are burning in your heart and need to be addressed. Miss Abigail is being brought to tantalizing life by Julie Lemos, a sincerely and caring lady who has a whole library of rather dated books to consult in framing her replies. She is not without a bevy of clients from the world of the stars and she discreetly handles all their traumas and troubles. Why can't she not handle yours as well? Your table will even have forms to fill out so you too can get the messages you need resolved. Helping Miss Abigail is her assistant Paco, a truly accommodating Jon Escobar, who has a taco full of love issues all his own: he wants a personal relationship with the lady who mends hearts and he doesn't know how to ask for her help. 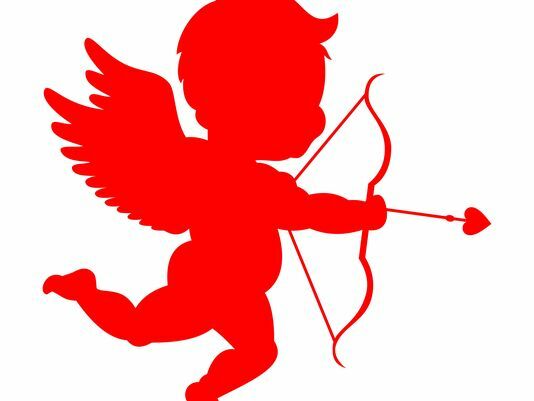 Be forewarned that the pair will draw you into the arena, in this case on stage, to assist in solving games that Cupid never thought of playing but are fun and silly and a riot to watch. Be a good sport if you are tapped to participate. Miss Abigail wants to aid in all your communication problems, to "gussy up your love life," to pass on classic advice, to help lonely and desperate people. She herself enjoyed a happy marriage and now that her husband has died she is devoting herself and her wealth of knowledge to others. She has tips galore and all the right moves to make magic happen, and hopefully Paco can learn what to do to resolve his personal hunger. Let master manipulator and relationship guru Kris McMurray use his guiding directorial hands to create the laugh fest that this fun comedy can generate. For tickets ($30), call the CT Cabaret, 31-33 Webster Square Road, Berlin at 860-829-1248 or online at www.ctcabaret.com. 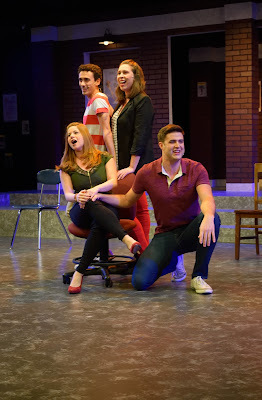 Shows are Friday and Saturday nights at 8 p.m., with doors opening at 7:15 p.m. Remember to pack goodies to eat and drink at your table or purchase them on site at the lavish dessert concession stand. The cabaret is preparing for an exciting 20th season so plan to subscribe for the new shows. Get your jazz hands ready to wave and clap as you learn the Ten Commandments for Couples and other pertinent heartfelt advice. BRIAN DENNEHY STARS AS HAMM IN "ENDGAME"
Playwright Samuel Beckett, a master in the Theatre of the Absurd, is a genius to some and a puzzlement to others. You have the unique opportunity to discover your own interpretation until Sunday, February 5 as Long Wharf Theatre presents what is termed Beckett’s greatest work, “Endgame,” on Stage Ii on Sargent Drive in New Haven. Be prepared to enter a grey world that opens with a deafening noise and closes with barely a whimper. It is at once a barren room and at the same time stuffed with clutter. In it are four lost souls trapped in an existence of their own making, one that defies escape and does not welcome hope. The residents of the space are vulnerable and isolated and pathetic, unable to rise above their static inaction. Think “Groundhog Day” with repetition day after day, a futile sameness to the human condiiton. Presiding over his personal kingdom is Hamm, residing on a make believe throne, a chair on wheels, that he commands his servant Clov to maneuver from place to place at his bidding. 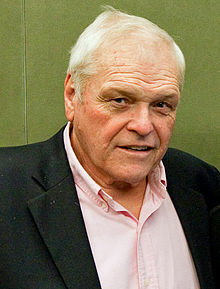 Brian Dennehy’s Hamm is the masterful but cruel evil monarch who directs the every movement of the players in the “farce” of life. Hamm is blind and cannot stand while Clov sees “zero” and is unable to sit and there is a constant pull and push between them about staying or leaving. They need each other symbiotically but are unable to decisively make a stand. Clov, an accommodating Reg E. Cathey, has the power to withhold Hamm’s painkillers and Hamm can make sure Clov has no food. Clearly a standoff of co-dependency. Suddenly revealed in this interplay between master and slave are the contents of two large dustbins tucked into the side of the stage where reside Hamm’s parents, Joe Grifasi’s Nagg and Lynn Cohen’s Nell, who laugh and cry in response to their tenuous situation and confinement. The futility of life is underscored, especially when Clov discovers a flea that has the poser to populate the world all over again and must be eliminated. This is the end of the world and the characters are waiting for the final move, like pawns or players on a chessboard that have been boxed in without viable choices to win the game. Even the king is left with no legitimate moves to succeed. Gordon Edelstein directs this drama of restrictions and freedoms with a spyglass focused on the fragility of the human state. Tuesday at 7 p.m., Wednesday at 2 p.m. and 7 p.m, Thursday at 8 p.m., Friday at 8 p.m., Saturday at 3 p.m. and 8 p.m. and Sunday at 2 p.m. and 7 p.m.
Come pull back the grainy bed sheets to reveal how Beckett views the world, right-side-up or topsy-turvy, it’s all for you to decide. 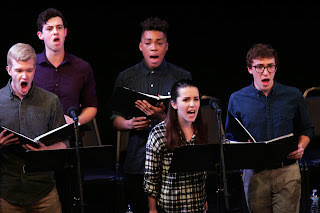 Lace up your running shoes because the race is on to meet the deadline for a submission to a contest for a new musical offered by the New York Musical Festival and your help and encouragement are needed. From now until Sunday January 29, you are invited to West Hartford’s Playhouse on Park to sit in at all the backroom drama and comedy and free-for-all nonsense as well as the blood, sweat and tears that go into writing a musical for Broadway in the new millennium. Entitled (title of show) by Hunter Bell and Jeff Bowman, the name refers to the space at the head of the application where title of show belongs. Peej Mele’s Hunter and Miles Jacoby’s Jeff are challenged to write a show with only three short weeks to deadline. When they are not procrastinating, they are busy seeking substance over fluff. The result is the ambitious, frenetic, fast-paced and forward thinking (title of show). They not only want to win the contest, these two eager collaborator/composers want to take their show to off-Broadway and then, to that most sacred of all places, Broadway…and we, the audience, get to go along for the bumpy ride. To that end, they enlist the aid of two show business friends Heidi, a bubbly Amanda Forker, and Susan, a happily neurotic Ashley Brooke, to meet their goal. With a trusty silent partner Larry, a talented Austin Cook, on keyboard, the quartet decide to write a musical about…writing a musical. They drop names and plays like gumdrops on a gingerbread house, allude to everything from monkeys to Mame to Mamma Mia, and to Shrek, Shakespeare, Sondheim, sequins and Sedaris, pay homage to Wonder Woman and Broadway and even sing a crazy and delightful song about Vampires, and dead ones at that. David Edwards expertly directs this mad, musical romp that went on to receive a Tony Award nomination in 2009 for Best Book of a Musical. For tickets ($17.50-50.00), call Playhouse on Park, 244 Park Road, West Hartford at 860-523-5900, ext. 10 or go online to www.PlayhouseonPark.org. Performances are Wednesday and Thursday at 7:30 p.m., Friday and Saturday at 8 p.m. and Sunday at 2 p.m. Watch for a play reading, “Human Rites,” for $5 on January 24, a night of Improv on February 3 and a comedy night on February 4. Discover for yourself the magic formula as well as all the hard work, creativity and genius that go into the penning of a successful show. OMG! Get your jazz hands ready! They’ll come in handy if you want to eat a Rice Krispie Treat. Musical theater geeks are especially welcome. 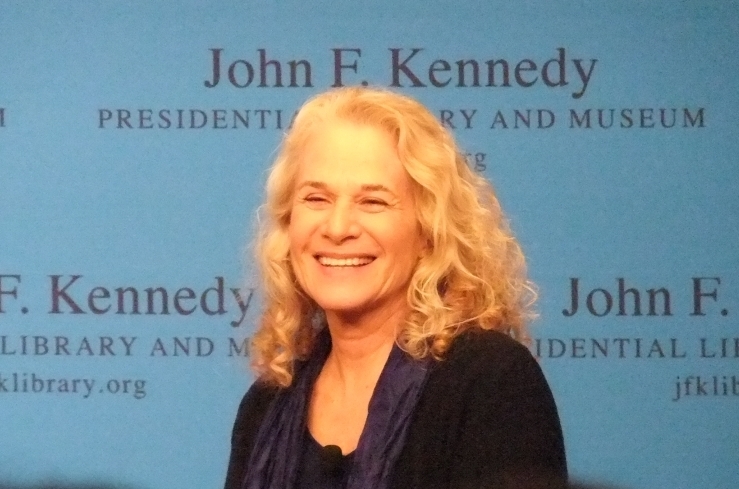 If beauty is in the eye of the beholder, it is also in the ear of the listener as well, especially if you’re talking about the super singer/songwriter Carole King. Her incredible musical story has been captured in a 2014 Grammy, Outer Critic, Olivier, Drama Desk and Tony Award winning show “Beautiful: The Carole King Musical” and it is jumpstarting its sparkle and sass at the Bushnell Center for the Performing Arts in Hartford from Tuesday, January 17 to Sunday, January 22 and it is not to be missed. From the musical moment when a17 year old King penned her first hit “Will You Love Me Tomorrow,” her career has been a rocket launch to the sky filed with stars, with 100 hit songs, 400 compositions, immortalized by more than 1000 artists. Legends like James Taylor, Aretha Franklin and Lady Gaga have riden the coattails of her musical genius, resulting in her winning an avalanche of achievement awards in the industry. Douglas McGrath has taken a tale about a hesitant teen, a Jewish girl named Carol Klein, and spun it like gold into a Cinderella story of a voice that propelled a generation. Called both awesome and amazing, with a parade of wall-to-wall hits like “You’ve Got a Friend,” “Up on the Roof,” “The Locomotion,” “Take Good Care of My Baby,” “I Feel the Earth Move” and ”Some Kind of Wonderful,” the show is a guaranteed crowd pleaser, one dazzling hit at a time. Following King from the time she meets her future husband and writing partner Gerry Goffin at Queens College, “Beautiful” encapsulates the triumphs and tragedies of her roller coaster life and her path to a pinnacle of success. Her collaboration with best friends and married musical partners Cynthia Weil and Barry Mann is inspirationally documented. For tickets ($36.50-132.50),call the Bushnell, 166 Capitol Avenue,Hartford at 860-987-5900 or online at www.bushnell.com. Performances are Tuesday to Thursday at 7:30 p.m., Friday and Saturday at 8 p.m. and Sunday at 6:30 p.m. A special three course dinner prepared by Max’s Catering will be held before showtime on Thursday, Friday and Saturday for $60, tip included, beverages extra. Deadline for reservations is noon, Sunday the 15th. Come let the earth move under your feet in some kind of wonderful way as you enjoy this stupendous salute to one of America’s sweetheart singer/songwriters, Carole King. If you aren’t into skiing, skating, sledding or sitting in front of a roaring fire, what do you do to enhance or endure the long cold winter months New England is noted for? The antidote for winter blahs is clearly the Goodspeed Festival of New Musicals, now in its twelfth year of providing the great escape for freezing toes and icy noses. Produced by the Max Showalter Center for Education, this year’s festive festival will be held at Goodspeed in East Haddam for the whole weekend of Friday, January 13 to Sunday, January 15 and you’re invited to participate in the joy of the occasion, no snow shoes, skis or skates required or even necessary. The weekend is packed with pleasure for all theater lovers who can come to see a trio of brand new musicals as well as attend seminars, lectures, previews, cabarets and a dinner. Opportunities galore will be available to speak to and listen to the best writers and actors in their fields and be present as staged readings will be mounted featuring students from the Hartt School of Music in Hartford and the Boston Conservatory of Music. Excitement will be swooping and pulsing from every corner of the Goodspeed as well as next door at the Gelston House and across the street at the La Vita Restaurant. Take your vitamin pills because Saturday requires energy and enthusiasm. It begins at 10 a.m. to 12:45 p.m and features a full morning of seminars like how Cirque du Soleil is expanding its borders to cross into Broadway. As Cirque Theatricals, it is embracing a new show “Paramour,” and the process will be explained by Jayna Neagle, Executive Director, and Elizabeth Shumate, Associate Producer in "Cirque Goes Broadway." Jack Viertel, famed Broadway producer, will discuss his new book “Secret Life of the American Musical” with theater critic Frank Rizzo. If the life of a Broadway stage manager is of interest, look no further than Chris Zaccardi and his stories and insights on his career, especially as it relates to the Broadway revival of “Hello Dolly! with Bette Midler this spring. The vibrant history of The Goodspeed will be revealed at 1:30 p.m. with a colorful tour in front of and behind the scenes followed at 3:30 p.m. with a musical preview of all three of the trio of new musicals to be featured at Goodspeed’s little sister theater, The Terris. If you purchased the $139 GOLD Package, you will now enjoy a Festival Dinner at 5:30 p.m. at either the Gelston House or La Vita. The SILVER Package at $80 will include an abbreviated selections of choices. For reservations, call the box office at 860-873-8668 or online at www.goodspeed.org. Single tickets at $25, students $15, are also available. The second musical offering is “ZM” at 7:30 p.m. with music by Mark Hollmann, book by Greg Kotis and lyrics by both, and features a pair of fast food workers and a sandwich that may have the powers to turn any one who eats it into a zombie. Yum! This from the clever guys who brought us “Urinetown The Musical.” A cabaret at the Gelston House at 10 p.m. will broadcast the talents of Mark Sonnenblick, a prize winning librettist. On Sunday afternoon at 1 p.m., “Row” with book by Daniel Goldstein and music and lyrics by Dawn Landes will set sail, based on the book by Tori Murden McClure, “A Pearl in the Storm.” This true adventure took place in 1998 when McClure attempted to row across the Atlantic and landed in the eye of Hurricane Danielle by accident, discovering much more than she bargained for finding. At 3:30 p.m., the festival will conclude with a reception at the Gelston House with the three teams of composers answering questions about their process and how they created their works. Be sure to clear your front walk and your calendar so you can be an active participant in this inspiring and exciting weekend of new musical theater that is the Goodspeed Festival.